Most commonly, melanoma metastasizes via regional lymph nodes. 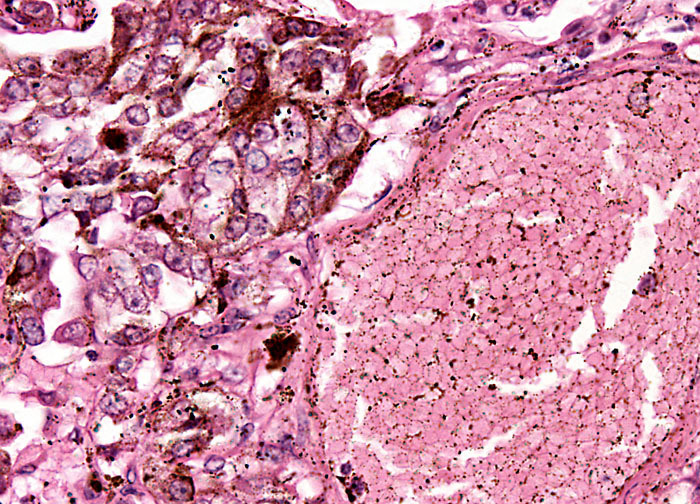 When nodal involvement occurs in a patient with melanoma, the disease is said to be in stage III, and when distant metastases have already formed the cancer is considered a stage IV disease. In order that melanoma can be detected in earlier stages of the disease, when it is more readily treatable, those that are at risk should regularly screen their skin for any new growths or any changes in preexisting moles. Any notable alteration in symmetry, border shape, size, or coloration of a mole should be of special concern and be brought to the attention of a medical professional.